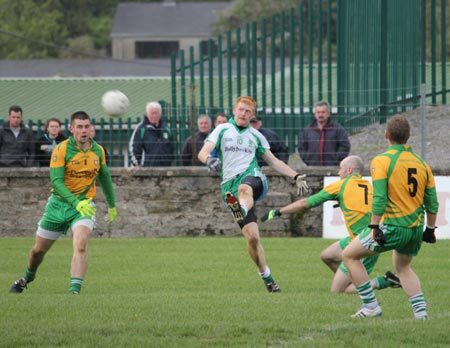 So Saint Naul's are through to the next round of the championship, but their progression hung upon a controversial piece of refereeing by Michael McShane which saw the ball end up in the Aodh Ruadh net. The match itself was a nervy, hard fought affair with every score hard hewn. The homesters passed up a gilt-edged chance to open the scoring two minutes when PJ McGee ballooned wide from the edge of the penalty area. They opened their account three minutes later when a low flighted 45 was punched over by Brian Roper. 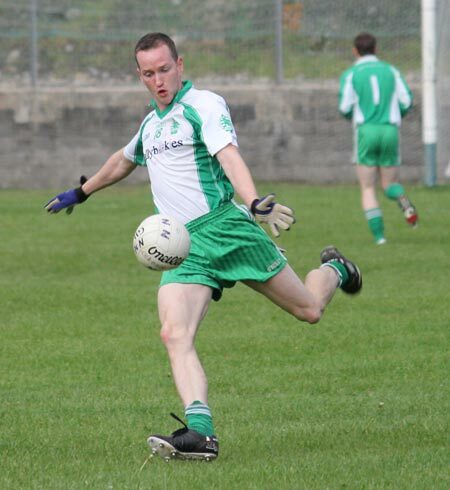 It took another five minutes before Saint Naul's could engineer a response, that a lovely long range point from Mountcharles's danger man, Stephen Griffin. Griffin added another free with 19 minutes on the clock. Another five minutes passed before Brian Roper showed phenomenal guts and strength to win an 80 / 20 ball on his own 40. He travelled, drawing a man before slipping off the ball to Michael 'Sticky' Ward, Ward fed on to Kerry Ryan who converted a relatively simple score to level matters at 0-2 apiece. Saint Naul's edged back in front a couple of minutes later when Stephen Griffin pointed a 30 free directly in front of the posts. Roper missed an opportunity to restore parity a minute later. The last meaningful action of the second half was a yellow card for Kerry Ryan, a caution which would come back to haunt him. 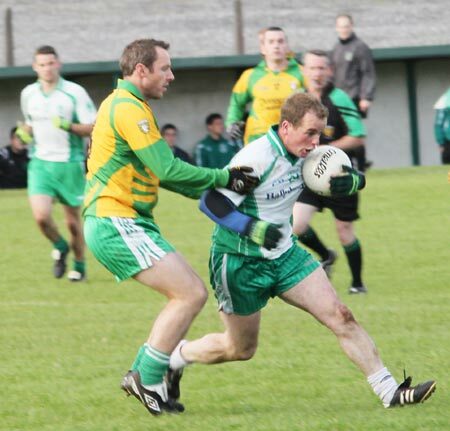 After an attritional first half it was the Mountcharles who held the advantage, 0-3 to 0-2. 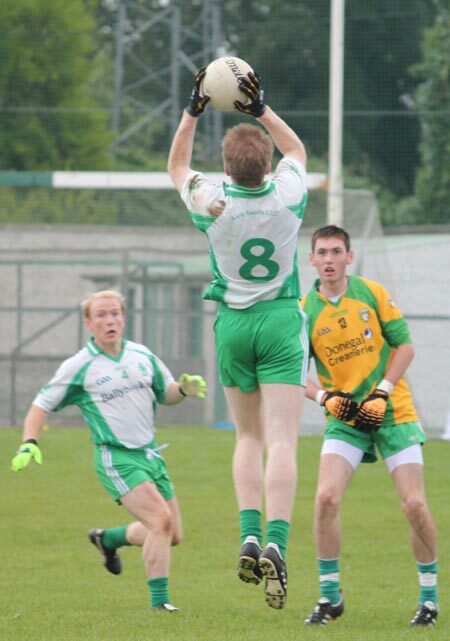 The second half was only 20 seconds old when Kerry Ryan leveled matters once again with a close range left foot point. But once again Naul's were prompt in their response, Griffin once again on the end of the move slicing of an excellent point from out on the right. 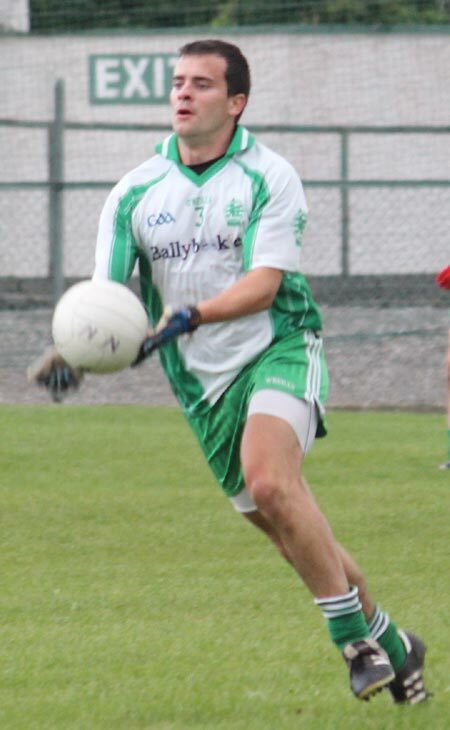 Shortly afterwards Conor McBrearty was down for a sustained period of treatment. When Lowther was recovered Griffin put two points in the game for the first time, floating over a majestic point from distance. 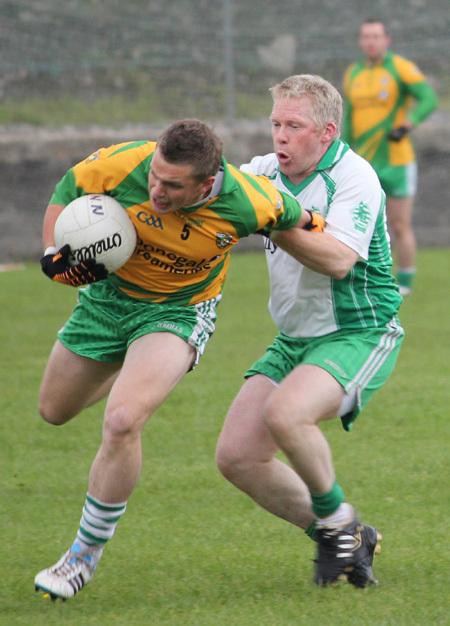 To compound Aodh Ruadh's problems Kerry Ryan and Barry Griffin tangled and the pair received yellow cards. With Ryan already on a booking, he received his marching order. Barry Griffin didn't cover himself in glory, goading Ryan as he went off, Ryan doing well to maintain his cool. Brian Roper rose to the challenge and fired over a great point off the left boot to reduce the deficit to the minimum. 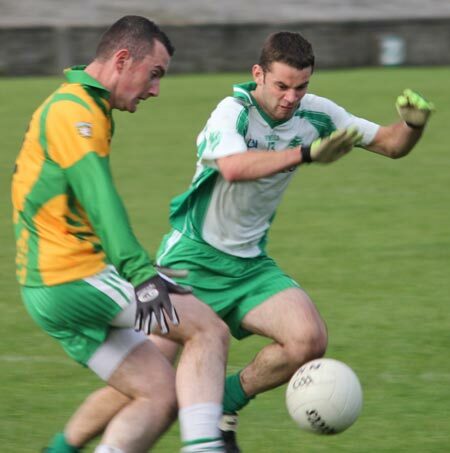 Anthony Boyle and Shane McShea then came on in a double substitution for Aodh Ruadh. The switch reaped instant dividends when good work from Boyle was finished off with a point from Sticky Ward to put the sides at 0-5 apiece. 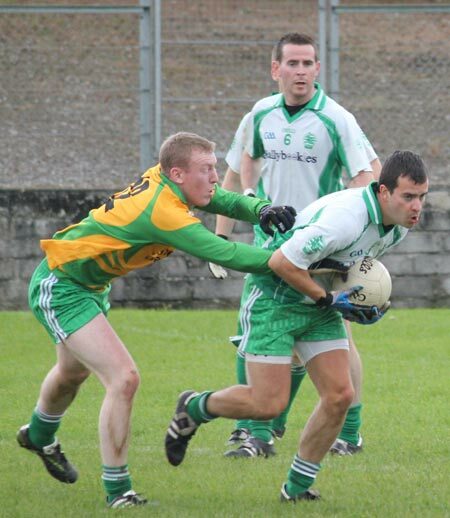 Entering the final quarter Aodh Ruadh were not looking the worse for the sending off and the game was in balance. That was until a pivotal and controversial decision from Michael McShane left the Ernesiders with a mountain to climb. 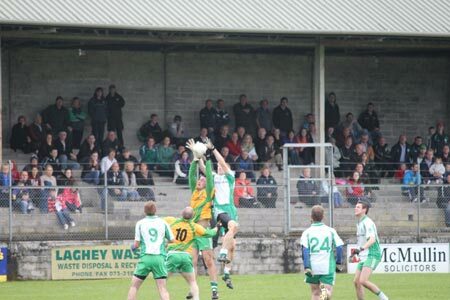 Mountcharles launched a long ball in from their own 40 with Barry Griffin, being shadowed by Michael Dolan, the target. McShane whistled for an off the ball infringement, but the ball ran on some 15 metres beyond the point of the infringement. Barry Griffin opportunistically took the free from the wrong spot to his brother Stephen. 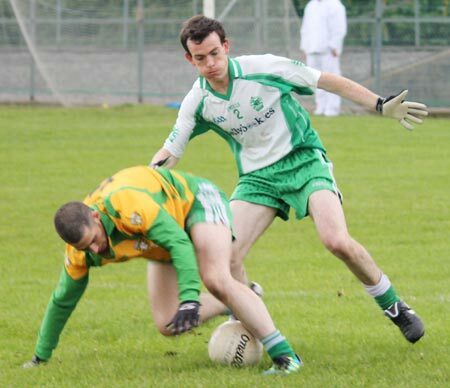 Aodh Ruadh defenders put in desultory efforts to halt the run of the county man, clearly caught between expecting McShane to recall play and stopping Griffin. The home crowd watched in disbelief as his shot slipped into the net under the left hand of Peter Boyle and McShane awarded the goal. 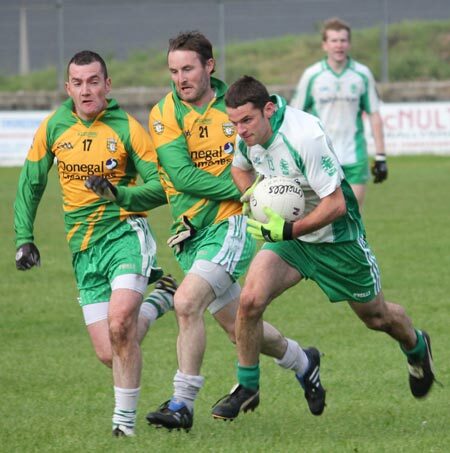 The Aodh Ruadh players protested vigorously, but McShane was not for turning. 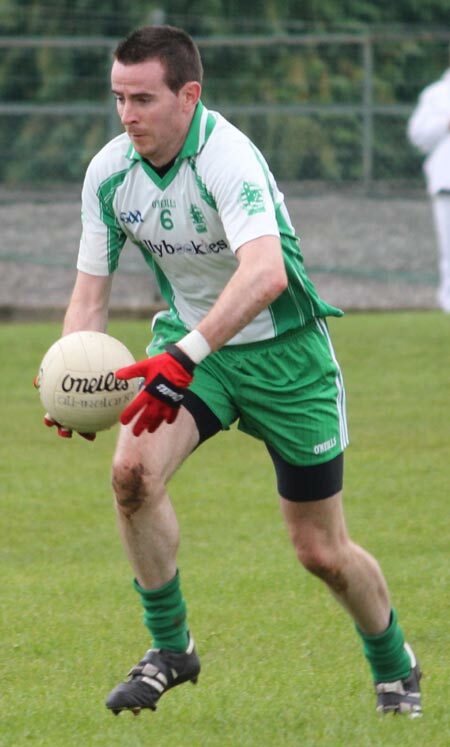 With ten minutes left in a match where scores were like gold dust it looked like a huge ask for Aodh Ruadh to come back. And so it proved. 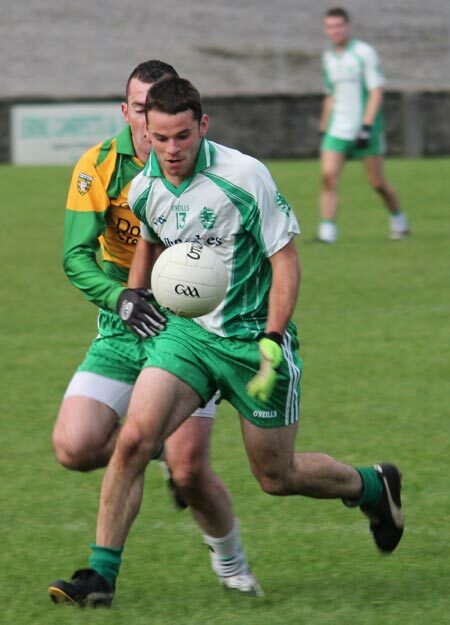 Sticky Ward pointed a free with five minutes remaining to leave Ballyshannon hunting a goal to take the tie to a third game. Again McShane did the homesters no favours; after playing three minutes of added time in the first half, he blew up on a minute and 50 seconds in the second, despite a lengthy injury to Conor McBrearty earlier in the half. 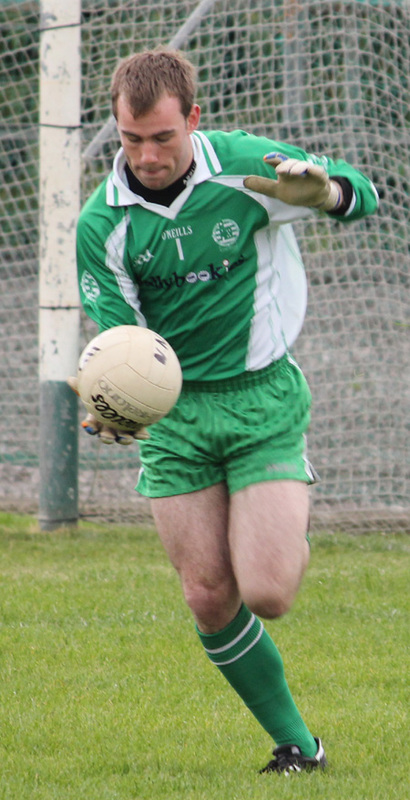 Aodh Ruadh's best efforts in the closing stages were in vain and when the final whistle went it was the Saint Naul's supporters who were cheering. They now fix their sights on the next round while Aodh Ruadh's faithful will be debating McShane's goal call for some time to come. 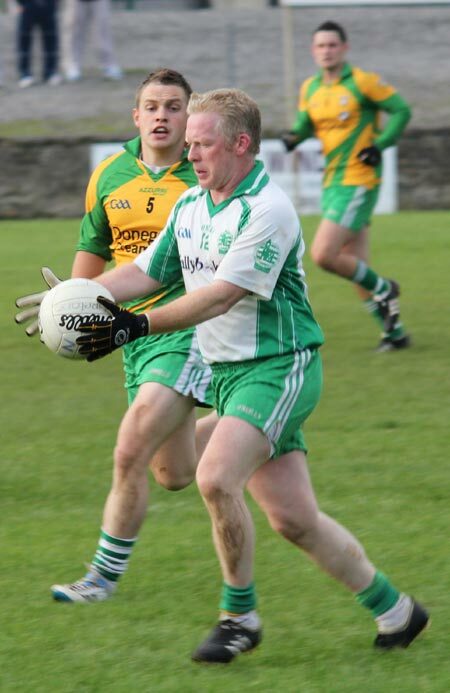 Peter Boyle; Michael Dolan, Johnny Gallagher, Philip O'Reilly; Kieran Keown, Ciron Whoriskey, Michael Gurn; Conor Gurn, Darren Drummond; Kerry Ryan (0-2), Turlough McIntyre, Brian Roper (0-2), David Dolan, Michael 'Sticky' Ward (0-2, 1f), PJ McGee. Substitutes unused: Paul Kane, Ronan McGurrin, Niall McCready, James O'Donnell, Conor Patton. Yellow Cards: Philip O'Reilly: 20 minutes; Kerry Ryan: 31 minutes, 38 minutes; Conor Gurn: 35 minutes. 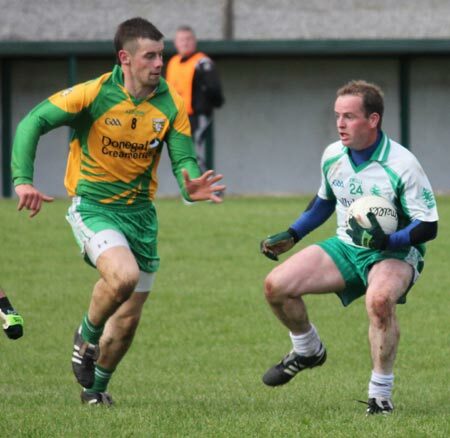 Shane Leonard; John Rose, Gavin Maguire, Conor McBrearty; Stuart Johnson, Daniel Friel, Aidan Kennedy; Conal McGinley, Fiachra McGinley; Eddie Gallagher, Cathal Lowther, Shane Coneely; Barry Griffin (0-1), Stephen Griffin (1-4, 2f), Pauric Coyle. Substitutes used: Paul McGroarty for Pauric Coyle: 41 minutes; Danny McDyre for Shane Coneely: 52 minutes. Substitutes unused: Sean McCready, Liam McGourty, Jamie White, Connor McGowan, James Flynn, Michael Quinn, Mark Ward. Yellow Cards: Paul McGroarty: 31 minutes; Barry Griffin: 38 minutes; Conor McBrearty: 52 minutes; Cathal Lowther: 57 minutes.